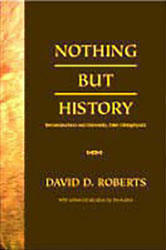 Title: Nothing But History Author: David D. Roberts Series: Critical Studies in the Humanities soft cover 440 pp. USD 27.00 ISBN 978-1888570991 December 2008 In this reissue of a highly praised intellectual history, which traces historical and anti-historical themes from Nietzsche, Croce, and Heidegger to Gadamer, Foucault, Derrida, and Rorty, David Roberts pinpoints tendencies toward overreaction in the postmodern turn, and shows how historians can deepen their self- understanding and play a more central role in a postmodern culture. His way of rethinking such contested categories as presentism and relativism, master narratives and "others," enables us better to understand the cultural place of historical inquiry. Included is a new preface that responds to critics and places the work within the changing framework of debate over postmodernism and history. Contents Preface to the new edition Preface to first edition 1 Postmetaphysical History: A Difficult Adjustment; Dissolving and Inflating the Historical; Expansion and Polarization in Empirical Historiography; A Historical Approach to the Changing Culture of History 2 Tentative Steps into History: From Vico to Dilthey: The Question of Modern Historical Consciousness; Individuality and Completeness in Vico and Hegel; Historicism and Historiography after Hegel; Dilthey and the Unfinished Revolution 3 The Reduction to History: New Confrontations with Time and History; This Particular World; History, Language, and Individual Experience 4 Nietzsche: The Innocence of Becoming: The Trouble with History; Emptiness and Connectedness; Reshaping the Past; Affirming the Particular Totality; Nietzsche’s Triple Legacy 5 Croce: History as Thought and Action: Croce’s Uncertain Legacy; A Postmetaphysical Historicism; Knowing the World as History; Experiencing Action as History; Commitment and Collaboration, Humility and Faith; Croce’s Limits 6 Heidegger: Historicism, Disengagement, Holiness: Heidegger and the Reduction to History; Being and Time and After; Being and History, Our History and Nihilism; The Scope for an Active Response; Out the Other Side of Historicism; Attuning Ourselves to the Sending 7 Gadamerian Hermeneutics: Belonging to a Growing Tradition: Interlude: Pathways in a New Terrain; Heidegger, Gadamer, and Croce; Belonging to History; Confinement and Openness; Concealment and the Fusion of Horizons; The Authority of Tradition 8 Deconstruction: The Uses and Limits of Perversity: Deconstruction and the Cultural Displacement; Foucault and the End of Man; Derrida and the Dissolution of Metaphysics; The Premium on Disruption; Plausible Extremity; Overreaction and Preclusion 9 Pragmatism, Historicism, Aestheticism: Rorty’s Neopragmatism; From Foundations to History; From Philosophy to Textualism; Irony, Redescription, Autonomy; Suffocation, Weightlessness, and the Prophets of Extremity; Reconnection and Truth 10 Past, Process, and Contest in Contemporary Historiography: Historiographical Openness; Processes to the Present; The Uncanny Past; Scott versus Himmelfarb; Groups, Processes, and Axes of Contest; Polarization and Revitalization 11 Responding to the World as Historical: Postmetaphysical Moderation; Care, Learning, and Truth; The Process of Interaction; Between Rational Critique and Disruptive Play; Openness and Risk in Historiography; The Extremes and the Middle Ground Notes Index Author David D. Roberts is Albert Berry Saye Professor of History at the University of Georgia. In addition to the present book, first published by the University of California Press in 1995, Roberts is the author of The Syndicalist Tradition and Italian Fascism (1979), Benedetto Croce and the Uses of Historicism (1987), The Totalitarian Experiment in Twentieth-Century Europe: Understanding the Poverty of Great Politics (2006), as well as two books in Italian and numerous articles and reviews. He has served as President of the Society for Italian Historical Studies (2001–2003) and Chair of the University of Georgia Department of History (1993–1998).